Across Ontario, the province's largest resort association, Resorts of Ontario, has come up with some exciting new family deals this summer. Here are a few examples, along with the prices for comparison. [caption id="attachment_103" align="aligncenter" caption="The notorious pirate ship Wenonah II on Lake Rosseau. Photo: Karen Campbell"] [/caption] Clevelands House on Lake Rosseau in Muskoka, prides itself on its family programming. 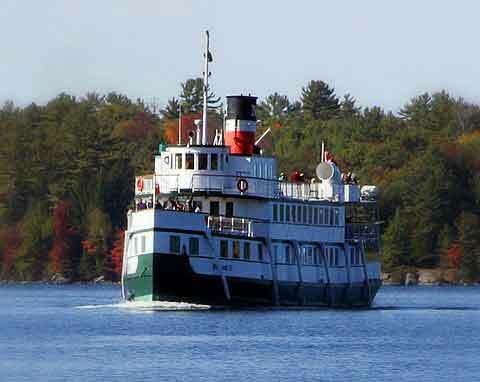 This summer, it has teamed up with The Real Muskoka Experience to offer a new Pirate Ship Dinner Cruise on the Wenonah II every Thursday night, beginning July 2nd. Mini three-night Vacations with meals start at $675 per adult at Clevelands House. Children from three to eleven years pay half the adult rate. Special family discount packages are available on certain weeks throughout the summer. Click "rates" for further details on their website. For active teens, Killarney Mountain Lodge on upper Georgian Bay near Killarney Park has guided hikes, sea-kayaking and canoeing, great homecooking and its cavernous recreation hall with its shuffleboard, table tennis, heated outdoor pool and giant sauna is a popular teen hang out. A three-night adventure package with meals included is priced from $575 per person. In the Kawartha Lakes, Scotsman Point Resort is celebrating its 60th anniversary with a specially priced Celebrating Families package for the weeks of July 7-11 and August 29-September 5. Known for its great fishing, child-friendly waterfront and home baking, the resort's two-bedroom apartment units and two-bedroom cottages are priced on these weeks at $949 and $999 respectively. Three-bedroom cottages, which can sleep up to seven, are priced from $1249. Taxes are extra. All units have fully equipped kitchens, colour TV, electric heat and gas BBQ's. Glen House Resort is in the Thousand Islands, an integral part of the Frontenac Arch Biosphere Reserve, part of a UNESCO World Network of Biosphere Reserves. This resort has indoor and outdoor pools, sauna, tennis, an exercise room, volleyball, games room, fishing charters, hiking trails, a beach, canoe, kayak and pedalboat rentals, and its own 18-hole championship golf course. Its three-night Explorers Package includes a room with deluxe breakfast from $58 (per person, per night, double occupancy) and for $60 extra, per person, there is complimentary use of all amenities plus a choice of two out of these three attractions: a 1000 Islands Cruise, a four-hour boat & motor rental, or a live performance at the 1000 Islands Playhouse. Here is a more complete listing of family resorts.